Once I saw photos of the sandwiches from Mr. Crackles with roast pork, I knew that I had to pay them a visit. Mr. Crackles is located in Surry Hills, not too far from the CBD. This entry was posted in Eat and Travel and tagged bbq pork, pork crackling, roast pork, sandwiches, Sydney. 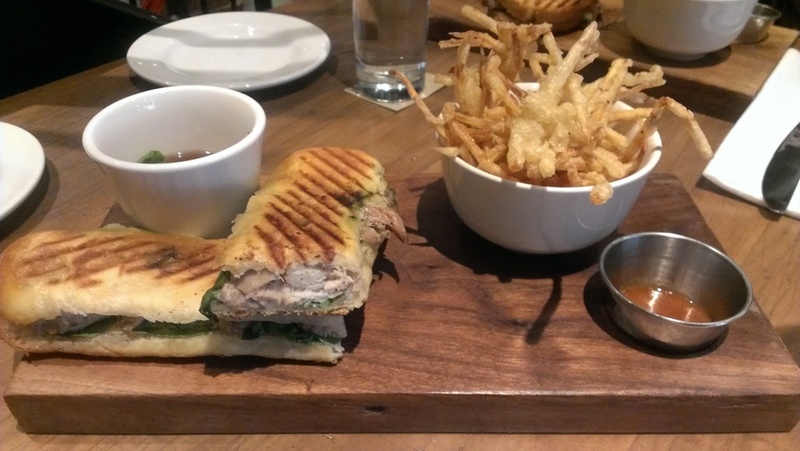 My co workers and I went to Tuc Craft Kitchen for lunch after seeing their enticing menu. Basically everything looked good! We went on a week day and I was surprised that it wasn’t very busy at all. The restaurant also has a small upstairs section. The decor was really nice too with high ceilings and touches of wood. Classy but not too fancy? Okay maybe that’s just a Gastown thing now. We had all discussed this sandwich and it was a popular choice for sure! This was the Beef Brisket and Pork Crackling Sandwich with Smashed Potato Fries. That just sounds delicious already right? 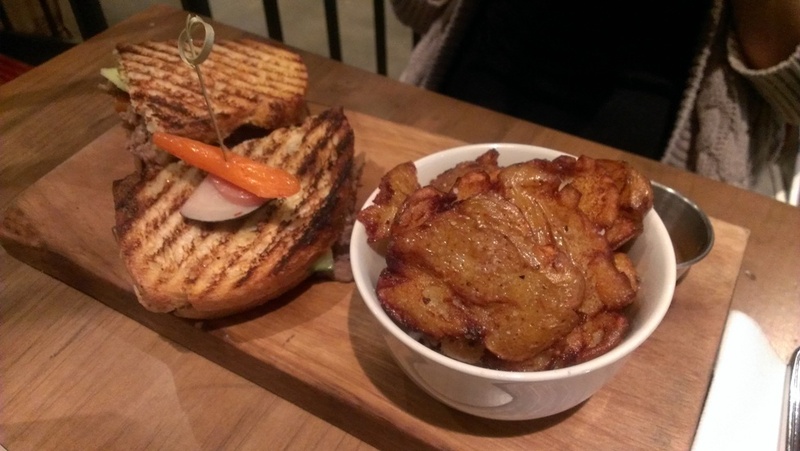 The sandwich was crunchy from the crackling and there were tender pieces of brisket interspersed in the sandwich. There was also some salsa verde and mustard in the sandwich and it reminded me of Meat and Bread a bit. The smashed potato fries were really just delicious fried pieces of potato. I think I preferred these to the parsnip fries though. This was also served with coriander ketchup. Guess what this is? It’s apparently called a “Runsas” and every day they have a different filling in it. On the day that I went, they had fried chicken and cheese which sounded pretty good when the server described it so I decided to try it. 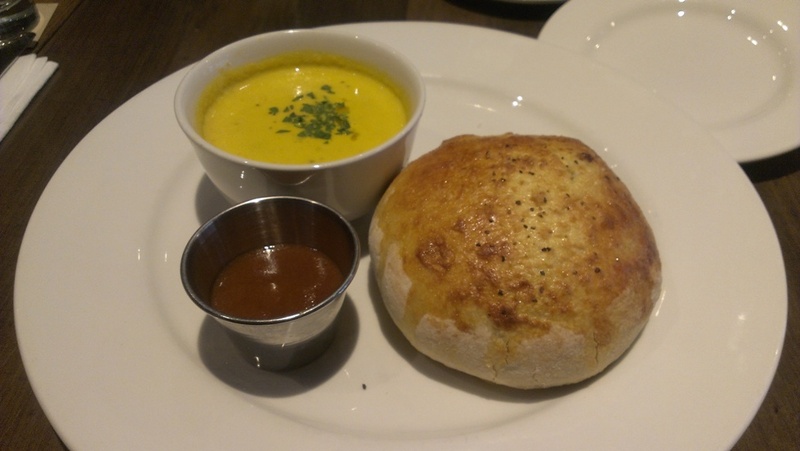 It also came with a cream of vegetable soup. The soup was good but I couldn’t tell what kind of vegetables were in it. It was not too heavy though. The pastry part of the runsas is supposed to be made of pizza dough and we all found it to be a bit doughy and dry. Maybe that’s why it was served with coriander ketchup? I was expecting more of a soft of chewy type of pastry. Order the sandwiches guys!!! You won’t be disappointed. They were both awesome and I will totally come back for them. I would also like to try brunch and dinner now. This entry was posted in Food Reviews, West Coast and tagged beef brisket, lunch, pork crackling, sandwiches.